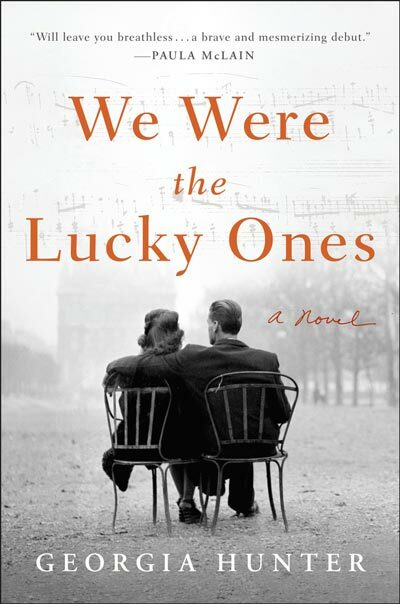 On Tuesday, I sent the latest version of The Lucky Ones to Jane Fransson, an editor who’s worked with a host of successful authors, several of whom I’ve read and loved (e.g., Pamela Druckerman, Bringing up Bébé; Sadia Shepard, The Girl from Foreign). Admittedly, I held my email captive in a draft folder for a full day until I finally summoned the courage to set it free. I knew the moment the book left my hands I’d review it and find a typo, or something I would change. But I also knew it was time to let go. And so I hit send, and when I did I was immediately relieved. And scared. And excited. But mostly relieved. Jane will be the first person to read The Lucky Ones who hasn’t any previous knowledge of my family’s story, aside from what she’s read on my blog and the snippets I’ve shared with her in conversation. I’m both eager and anxious to get her thoughts, and I can’t help but wonder—will she be able to keep track of all of the characters? What will she think of the present tense? The conversational tone? Will she get half way through the manuscript (now 390 pages!) and want to put it down? Or will she be as fascinated by each of the story lines as I am? Jane promised she’d have my manuscript back to me by the 26th of November. Thanksgiving Eve. Until then, in an effort not to obsess over what she might be thinking at this very second, my plan is to keep busy. 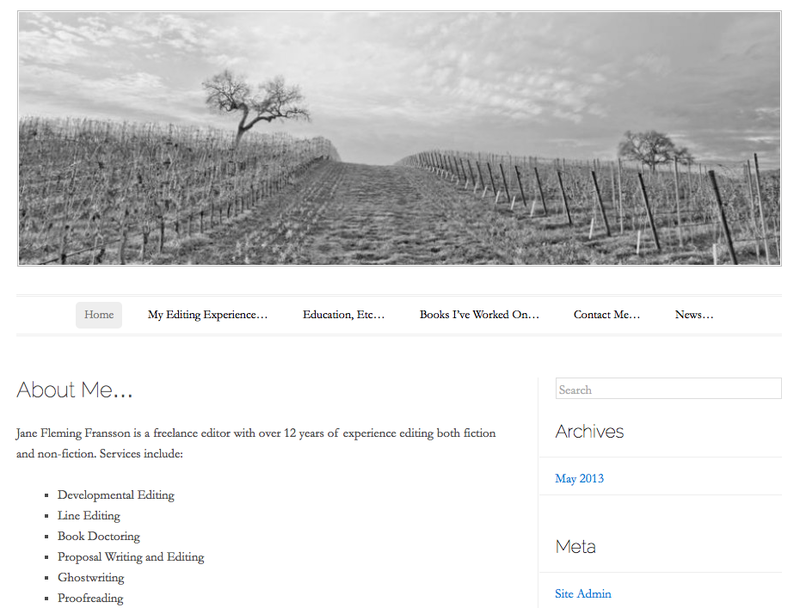 I’m about to get to work on the book’s Introduction and Afterword. And to translate a slew of records I received last week from the International Red Cross (in response to an inquiry sent in 2011!). And to connect with a woman who contacted me recently through my blog, whose maternal grandmother married a Kurc from Radom—a young man she met at a Displaced Persons camp in Stuttgart, Germany (where my grandfather’s brother Jakob also resided after the war)—surely, Ms. Mariam White from Toronto and I are in some way related. 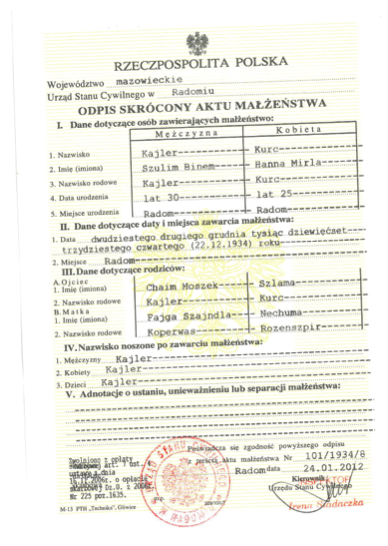 The Red Cross sent me eleven pages of records, including this 1934 marriage certificate for Mila and Selim, which they tracked down through the Registry Office in Radom, Poland. If I’ve learned anything since taking on this project, it’s that there is always something more to learn or someone to connect with when it comes to researching and recording a family history. So keep busy I will! Of course, I’ll also be secretly counting down the days until November 26th, and praying that my trusted editor will offer up some feedback I can be thankful for come turkey-carving day. Whatever Jane’s reaction, though, I’m grateful for the opportunity to work with her—I know we will make a good team—and for the chance to celebrate another much-anticipated milestone.